Easily manage your store documents numbering using prefixes and custom starting numbers. Fluently change counter increment step to protect your business data from competitors and attract more customers. Store owners often need to change Magento 2 order numbers either for customer convenience or to keep business information safe. In such cases, they need specific functions because native Magento numbering is not very convenient. With custom order module store owners can easily customize invoices, shipments, orders and credit memos according to their needs. It’s not a secret that customers are more likely to buy items in big and trusted shops that have lots of buyers. Very often people can judge about your sales volumes by the order numbers. 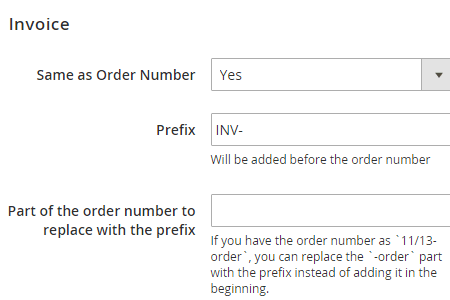 With Magento 2 custom order number extension you can easily change starting order numbers and Magento 2 invoice numbers by adding relevant prefixes and increment steps. With the help of the Magento 2 custom invoice number module you can set necessary invoice numbering that meets jurisdiction requirements of your country or region in a couple of clicks. When you move from another e-commerce platform to Magento you often need to adjust order numbering. In this case, you just need to set order starting numbers and implement them for the new site. See how to migrate all your data to Magento 2 securely. 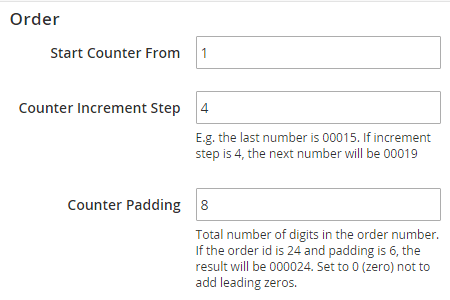 Thanks to Counter Increment Step option you can change the real numbers of consecutive orders. E.g. when increment of 4 is set, it means that if the first order has id 1, the second one will have id 5. Make sure your business data is kept secure. The module enables you to set Magento 2 custom order numbers manually. If you specify the starting number and an increment step, the module will change all order numbers respectfully. Using this feature you can keep real order numbers only for internal use. With the help of Magento 2 order prefixes and postfixes you can easily change number settings for the orders, invoices, shipments and other order documentation. You can implement a certain length for the order numbers to make them easy to perceive. E.g. if you set a padding as 4 it means that all your Magento 2 order numbers will have four symbols. Therefore, if you have an order starting with 2, its number will be 0002. Using this option you can easily export all your store data to CRM system. What is number padding or leading zero? See here. I have multi national audience and use 5 languages which caused one day a huge trouble with order numbers. At that time we looked for a solution to gradate the order for our admin users not just to hide the info from our competitors and the module did well from the start. I run it long ago and glad with the support and features, but after they added country code I'm more than satisfied. Responsive support and complete compatibility with magento 2 puts it in the first place. Just installed it caused some troubles conflicting with some 3party modules but the support was very helpful to fix this. Despite the previous variant I ran on m1 this one is much better. I couldn't see previous numbers on the last version and this extension has it all. Though it would be great to have duplications verification, as it'd simplify the work with it. Anyway, this's a good choice. I've been looking for such extension and finally chosen amasty's. It works perfectly with no issues in place. I'd really recommend this one. I bought many extensions from amasty and this was no exception. It works well for a year already and I'm thinking of buying the multi-warehouse too to use these two at most. Works from installation but I did have issues when creating shipments an’ orders. I contacted support an’ only got response in 2 days. Not cool, though solved my problem and promised to fix the module. So, I hope they will. I did it all myself without any outer help. I had some misunderstanding with leading zero for numbers but solved it with the guide. our company bought the extension from amasty because we have a lot of their tools and we are satisfied with the quality. however, we really need a tool which will give completely random order numbers without changing the settings again and again - automatically. there is no such tool on the market. Helpful module and support team. We've used it for 3 months and faced only one error on installation and the tech helped to fix it fast.